GUTHRIE, Okla. – Jess Tierney wants to win the CINCH Timed Event Championship in the worst way. It doesn’t look like it’s going to happen this year. “You want to win the average, and that’s why you come,” said Tierney, who has roped, tied and wrestled 20 head in a cumulative time of 333.8 seconds and is way off the pace of 219.4 set by his younger brother, average leader Paul David Tierney, the 2014 champion. That approach worked well for Jess, who posted a 50.0-second round during the fourth performance Saturday night at the Lazy E Arena. If that time holds out through Sunday’s final go-round, Jess Tierney will pocket $10,000 for that feat. “You’ve got to look forward to each day and your chance for money that day,” he said. The Timed Event has become somewhat of a family tradition for the Tierneys. Their father, Paul, has earned four championships (1987, ’91, ’97 and ’00). In addition to his 2014 title, Paul David Tierney was the runner-up in 2013 and 2015. He’s in great position to add a sixth Timed Event title to the family’s trophy case. They also have a strong affection for this championship, now in its 32nd year. “This event is something our family’s been a part of forever, and I hope we’re always part of it,” Jess Tierney said. “This is one event I look forward to all year, and we work on it all year long. Whether we come here and do good or not, we’re going to be working on it when we come home. 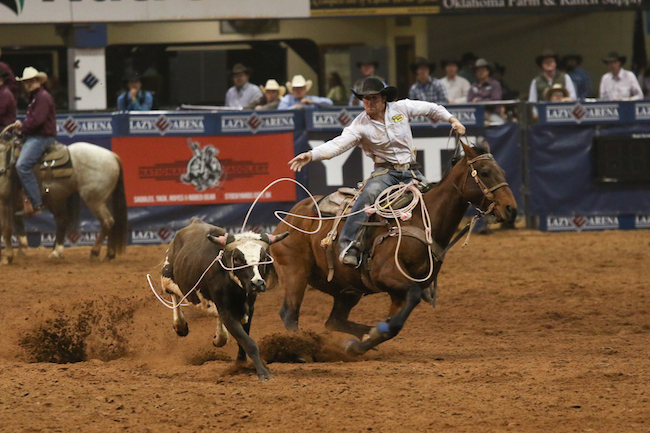 Paul David Tierney and Brazile seem to be in their own little battle for the coveted title – Brazile is 71 seconds faster than the third-place cowboy, Cody Doescher of Oklahoma City. It will all be decided during the final performance, set for 1 p.m. Sunday. That’s just the way it ought to be. Average Leaders: 1. Paul David Tierney, 219.4 seconds; 2. Trevor Brazile, 228.2; 3. Cody Doescher, 299.2; 4. Dustin Bird, 301.8; 5. Kyle Lockett, 306.1; 6. Josh Peek, 309.3; 7. Rhen Richard, 312.9; 8. Cash Myers, 328.6. Fastest Round Leaders: 1. Jess Tierney, 50.0 seconds; 2. Paul David Tierney, 50.8; 3. (tie) Trevor Brazile and Dustin Bird, 51.1; 5. Kyle Lockett, 51.6; 6. Landon McClaugherty, 52.2.